I can safely say that the Iain Sinclair CardSharp 2 is unlike anything else I have previously reviewed. A few months back the folks at Iain Sinclair contacted me about reviewing their latest version of their lightweight folding credit card knife, the CardSharp 2. Without much thought I decided it was something I’d be interested in. After all, it was a knife, I review knives – it seemed like an easy decision. The package that arrived a few weeks later totally took me by surprise. I knew what I had signed up for, I would be looking a some sort of fancy folding credit card knife, but I really never expected something this light and slim. I don’t have a lot of experience with with credit card knives, and at first glance this small piece of steel and folding plastic puzzled me. I opened my wallet with a shrug, and slipped the Card Sharp 2 inside. After an extensive period of use and testing I’m ready to offer some thoughts on this unique offering from Iain Sinclair. The CardSharp 2 really is a light use tool. It is as long and wide as a credit card, weighs just under half an ounce, and is a mere 2.2mm thick (similar to 2 credit cards stacked on top of each other). You won’t be able to break down a refrigerator box, blast through zip ties, pry, chop or even tackle a well cooked steak with the CardSharp 2. But I think that is ok. The CardSharp 2 is designed to be ridiculously light, impossibly slim, and totally unique. As for practical applications, this is a blade for those minor emergencies many people find in their day to day urban and suburban lives. I’m talking about opening a letter without damaging the envelope, clipping a coupon, or trimming a thread off your suit just before an interview. In my opinion, anything beyond cutting up a regular cardboard box is asking too much from the knife. The blade is a 3 inch drop point made from some sort of “surgical steel.” Knife circles commonly refer to this as “mystery steel” and it’s really anyone’s guess what exactly this blade is made of. I found that it’s pretty soft stuff, and can easily take a working edge. Edge retention? It’s ok – I’d put it on par with 420HC. Certainly passable for its intended use. So the handle of the CardSharp 2 is really what this knife is all about. Everything comes folded up into the shape of a credit card, and if you disengage the safety latch, pop out the blade, and fold a couple flaps over you get a fully assembled knife. Actual assembly is really quite simple, but if you would like a more detailed demonstration I recommend checking out my video. As far as construction is concerned, the handle of the CardSharp 2 is made entirely of plastic. The handle has flexible plastic hinges a couple series of snaps. This is what holds everything together. I’ve opened and closed the knife many times over the months and everything has held up fine. Will the plastic wear out after years of use? I have no idea. But over the past few months everything has been working well. I know a few people were disappointed to learn that the handles were made of plastic when I released a pseudo-video review a few months back, but honestly I wasn’t sure what else to expect for $25. Sure aluminum and carbon fiber would be great, but for under $30 I just don’t see how that would happen. Plus, the plastic handles have held up fine. I think another point worth noting is how well the Card Sharp 2 carries. Even though it didn’t get tons of use, the mere fact that I kept it in my wallet for all that time really goes to show how slim and light this thing actually is. When it comes to EDC, I’m a picky guy. I don’t like tons of bulk and I carry a very slim wallet. 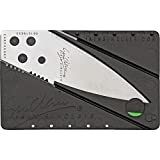 I don’t have much experience with credit card knives, but the the CardSharp 2 is much easier to carry than say, the popular Swisscard, which I find to thick to be regularly carried in my wallet. Dedicating a section to “ergonomics” here is something of a misnomer but I figured that I would say a few words. The CardSharp 2 is actually designed to fit the hand with some jimping and something of a finger choil, but in practice I found the knife best performed if you held it in a pinch grip. This is mainly to keep the knife from coming apart, but it did feel fine for light use. On the subject of deployment, the CardSharp 2 once again falls outside of my usual framework for a knife review. “Deployment” in practice is quite slow. You need to take out your wallet, remove the knife, put your wallet down, and fold the knife together. Needless to say you won’t want to count on this thing to save your life! However I think given it’s intended use the “deployment” here is just fine. And “lockup” would be another misnomer. The blade kind of snaps together, but it’s quite flimsy and easily comes undone. I think that’s fine, again, when you consider the intended use and overall limitations of the design. If you hold the blade in a pinch grip around where the pivot would be on a normal folding knife, the CardSharp 2 is sturdy and I think you will be able to get your light use tasks accomplished. I want to insert a small disclaimer cautioning you about attempting to take this knife on an airplane, or into a courthouse, or anything along those lines. The CardSharp 2 is easy to forget about, but if TSA found this knife in your wallet, it may generate an experience that you will always remember. As a fan of sturdy folding and fixed blade knives, the CardSharp 2 is not the first tool I would reach for when I need a job to get done. I feel like the CardSharp 2 caters first to the design crowd, then to gadget lovers and finally enthusiasts of cutlery. It’s an interesting design, but I would never replace my primary EDC knife with it. It’s a backup utility blade (or a backup for your backup) and a light use one at that. But doesn’t mean that the CardSharp 2 is without merit. The knife weighs practically nothing, disappears into a wallet, and can be had for around $25. Personally, I view it as cheap insurance for those rare instances when I don’t have a real knife on my person. If you like the design, are a fan of credit cards knives, or are simply looking for a little extra blade insurance, I think the CardSharp 2 is a good buy. I recommend purchasing the CardSharp 2 on Amazon. Purchasing the anything through the links on this website helps support the BladeReviews.com and keep the site going. Thanks so much for your support. This is an interesting little number. Although I’m not a fan of these little card knives (I feel like I’d stick it in my wallet, forget it, and end up getting nailed by TSA on a trip somewhere down the road.) You did a really good job with your photos on this one and showing how small it actually is! Hey Sahil! I tend to share your sentiments man, although having carried this one for so long I don’t mind it. I don’t get to travel that much so it’s not a huge deal for me. But if I was the kind of person who had to go on a lot of flights I’d definitely forget about it. Thanks man, glad you liked the photos. I have been playing around with a DSLR camera lately – it’s actually been a lot of fun. I also wear a knife in my wallet – a Benchmade Pardue 530 with a pocket clip taken off. It is much thicker than the CardSharp (~9,2 mm), but also is absolutely incomparable in sturdiness and functionality. I’ve read some very positive reviews of the 530 as an EDC knife, and for me it looks like a miracle: a small reliable knife with an Axis lock (which is my favourite type, on a par with the Tri-Ad lock), a very practical spear-point blade long enough to fulfill most duties of a city EDC and even for self defense, a thin profile and extremely low weight. I couldn’t agree more Earl! It seems like our approach to CC knives is very similar. Last ditch tools, that aren’t bad to have – unless you happen to be boarding an airplane! I’m glad your Marfione walked away unscathed, that is a nice knife to have to give up to TSA! Take care. I picked one of these up a couple of weekends back,and put it in my wallet,and until reading your review I forgot it was there. LOL I am happy with it. It is what it is. An EDC that is there if you ever need something extra. I only paid $20.00 so it wasn’t a big investment. It is built very well for something so small. Sharp is an understatement. Those that I have showed it to were impressed. Hopefully that is all I will do with it,but I have a very big imagination so I would prefer to have it,and never need it then to get into a snag wishing I had one. You did a very good job going over it so there’s nothing else I can add. Thank you for the interesting reading as always. I just had to check my wallet too – Yup! Still there! I agree with your line of thinking. It’s cheap insurance, and an interesting conversation piece. My pleasure man. So glad to hear you have been enjoying the reviews. I heard that the snaps on them dont hold is that true? I haven’t had that problem but could see how they would eventually wear out.